One of the best things about owning a GoPro is that you can use it in ways that you might not be able to use a traditional camera. Action shots and video are a snap with the right equipment – but what if you want to film while you’re surfing, white-water rafting, or simply hiking in the rain? The solution is getting a waterproof case for your GoPro. The right case can keep your camera protected in all kinds of weather while still allowing you easy access to the controls. You have plenty of options, but before we reveal our picks for the top 10 waterproof GoPro cases, let’s talk about what you should look for when you weigh your options. The fit is the first thing you need to consider. Some cases work for several GoPro models while others work only for one. 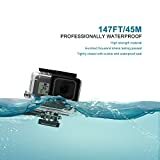 You’ll need to check the product specifications to make sure you get a waterproof case that will fit your GoPro. The next consideration is access to controls. Just because you’re filming in wet conditions doesn’t mean that you don’t need to be able to adjust on the fly. The case you choose should provide you with an easy way to get to the controls when you need them. Since we’re talking about waterproof cases here, it goes without saying that they need to be waterproof. You need to make sure that the case is reliable, sturdy, and won’t get knocked loose if you fall off your surfboard or get hit by a wave. The weight of the case matters since you’ll have to carry it with you. The best waterproof GoPro cases are lightweight and don’t add too much bulk to the camera. You may also want to consider whether you need a case large enough to hold accessories as well as your camera. It won’t help you to get decent footage if your accessories get trashed in the process. Finally, you’ll want to consider your budget. How much are you willing to spend? Some cases cost more than others, and you’ll have to weigh the features of each against your wallet to figure out which option will work for you. 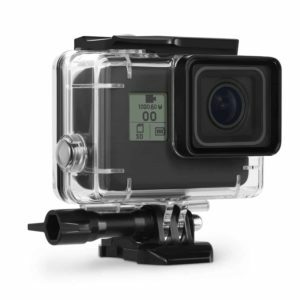 Now that you understand the basic features and requirements you should be looking for, let’s review our picks for the 10 best GoPro waterproof cases of 2018. 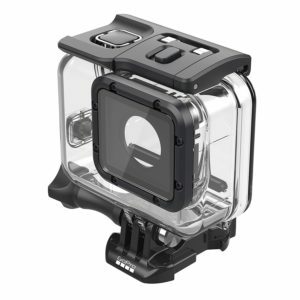 The #10 pick on our list is the Pacuwi Replacement Waterproof Case, which fits the Hero 3, Hero 3+, and Hero 4 cameras. It’s a clear case, which makes for very easy viewing when shooting underwater. It is waterproof to 40 meters underwater, which makes it a great choice if you want to shoot while diving. The case is lightweight and does a good job of protecting the camera in extreme circumstances. There are a few potential downsides. For example, some of the GoPro case backs, including some of the battery packs, won’t fit in this case. You also have to be very careful putting your camera in to verify that the rubber lining that ensures that the case is waterproof is thoroughly sealed. As long as you do that, you should be fine using this case. Our #9 pick is the 40M Underwater Waterproof Dive Protective Housing. This is a slim, lightweight case that is specifically designed for use while deep sea diving or doing other extreme activities. The lens made of clear glass so it delivers a very clear view as you use it. 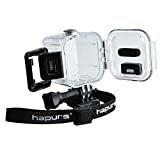 It is compatible with many of the GoPro housings so you can change those as needed. 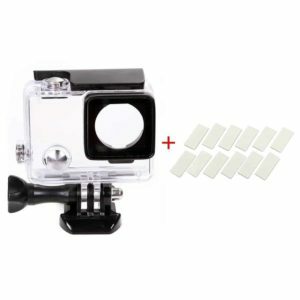 It will protect your GoPro down to a depth of 40 meters and even stays dry in extreme conditions. 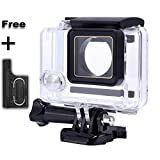 The biggest negative with this product is while the manufacturer says that it works with the GoPro Hero 3+, it will only do so if you remove the back of the GoPro, which exposes the battery. That’s a big downside, but it fits perfectly on the Hero 4. You’ll also have to be careful to close the case completely since if you don’t it may leak. The #8 pick on our list is the Deyard Underwater Waterproof Protective Housing Case. This case is specifically designed to endure the rigors of deep sea diving, and it does a great job of protecting the camera. It’s safe to use to a depth of 45 meters, and the flat glass lens ensures that you’ll have a terrific view while you shoot. It’s relatively lightweight, too. There are a few potential cons to consider with this product. 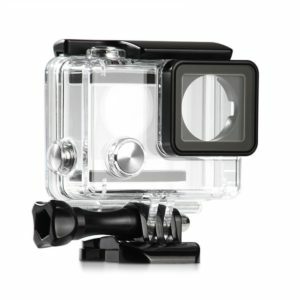 The first is that it’s made specifically for the GoPro Hero 5, so it may not work with earlier models. If you use special lenses for underwater shooting, they may or may not fit in this case – so make sure to check. And finally, this is a sturdy case but if you have an LCD touch screen you won’t be able to use it while your camera is in this case. However, if you don’t mind using the regular controls that might not be an issue. Coming in at #7 on our list is the Hapurs Diving Waterproof Housing Protective Case Cover. This case is a good fit for the Hero 4, and we like it because it is slim, lightweight, and resistant to cold. While it’s good for deep sea diving to a depth of 40-45 meters, its cold resistance also makes it a good choice for skiing, snowboarding, and other cold-weather sports. There are a few things that could be better about this case. The first is that it may fog up a bit as the battery heats up; however, you can offset that by putting a tissue in the case to absorb the moisture. The second is that using the case may result in some slight blurring around the edges of the frame. On the whole, though, this is a sturdy, lightweight case that will keep your camera safe. Our #6 pick is the SOONSUN Standard Protective Waterproof Dive Housing Case. 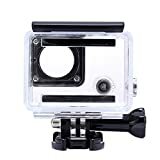 We like it because it’s made of high-quality, scratch-resistant plastic that delivers a clear, sharp picture even if you use it while you’re diving. 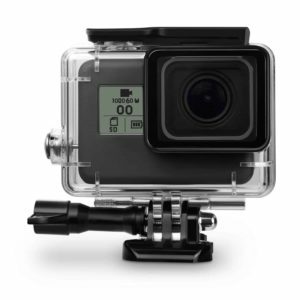 It will protect your GoPro Hero 4 and keep it safe down to a depth of 40 meters. It’s also extremely lightweight, weighing in at just over 2 ounces. The cases are tested underwater and the manufacturer provides excellent service. In terms of potential downsides, there is really only one big one. This case will work with the GoPro Hero 3, 3+ and 4, but only the housing cases for the Hero 4 will fit with this case. However, considering that this is a case that’s not made by GoPro, it’s high quality and works very well. Coming in at #5 on our list is the GoPro Super Suit with Dive Housing. It made our list because it will protect your Hero 5 to a depth of 60 meters – significantly lower than some of the other waterproof cases on the market. The glass lens allows for clear, sharp footage with no distortion. We do have a few potential issues. The first is that you must make sure to remove the Hero 5’s lens cap before putting it in the case, otherwise, it won’t fit. At deeper depths or with prolonged use, you may have to worry about some condensation inside the case. And finally, while the manufacturer says that the back door allows for access to the touch screen, the controls may be a bit glitchy and difficult to control through the door. The #4 pick on our list is the CEARI 45M Underwater Waterproof Diving Housing Protective Case Cover. We chose it for our list for several reasons. 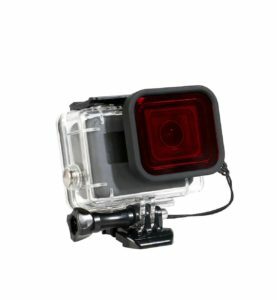 First, it will protect your Hero 5 to a depth of 45 meters. It has a coated, tempered glass lens to provide clear pictures, and color adjustment features to ensure you always get the right balance when you’re shooting. This case allows you to use the touchscreen features while still keeping your camera dry, and it’s very lightweight. There are a few things you should be aware of. This case fits only the GoPro Hero 5, so if you have an older model it won’t work. Also, the case includes a red filter, but the filter doesn’t fit well inside the case. Also, be very careful to dry the case after use. It has metal components and they may rust if you’re not careful. 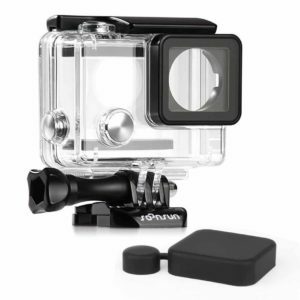 The #3 pick on our list is the Waterproof Protective Housing Case for GoPro made by Lcrystal. We like it because it’s very lightweight. The technology in the case allows for clear shooting with no distortion even when you’re underwater. 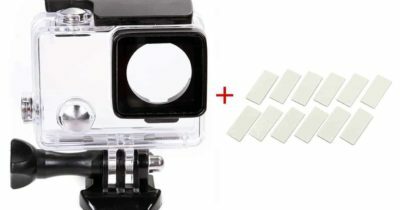 It will keep your GoPro dry to a depth of 40 meters, and it comes with 12 anti-fogging inserts that you can use to keep the case (and your pictures) clear. It also comes with a one-year warranty. On the downside, there are a few things to consider. The first is that the clips attached to it are a bit flimsy and not as well made as the rest of the case. Second, while this case is great for diving it doesn’t hold up as well in high impact sports. If you give your camera a lot of shocks while filming, you’ll probably want to go for a sturdier case. 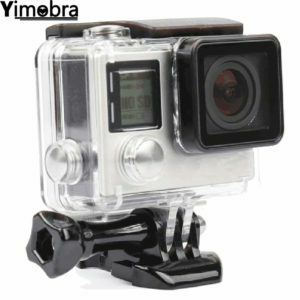 Coming in at #2 on our list is the Yimobra Waterproof GoPro Hero 4 Housing. 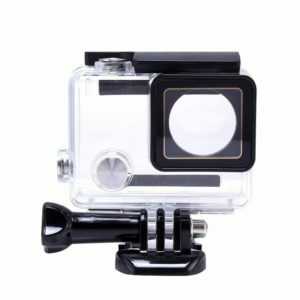 We like this product because it will protect your GoPro Hero 4 to a depth of 40 meters. It’s a very affordable and lightweight case, and there is no discernible difference between a picture taken in the case and out of it. There are a few minor issues with this case, and it’s important to be aware of them. The first is that the buttons on the case do not line up exactly with the GoPro buttons. They still work, but they take a bit of getting used to. The second issues it that while this case will fit the Hero 3 and Hero 4, the fit isn’t perfect and you may have to work to get your camera out of the case once it’s in. And finally, our top pick is the Kupton Housing Case for GoPro Hero 5 Waterproof Case Diving Protective Housing Shell. We chose it as our number one pick for a variety of reasons. First, it provides protection while still enabling you to shoot clear, crisp footage. Second, it’s extremely lightweight and durable. Third, you won’t have to remove the protective lens to put your camera in this case. 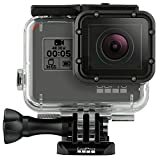 It’s affordable and very comparable to the original GoPro case. There isn’t much we don’t love about this case, but here are a few things to keep in mind. First, while this case will work with GoPro filters, it may not work with off-brand filters. You’ll also have to check to see if your existing accessories will mount in this case. But all in all, this is a terrific product and we highly recommend it. If you want to use your GoPro underwater, you need to make sure that you can count on the case you use to keep it dry and protected. The 10 cases on this list all deliver, and without adding much weight to your GoPro.